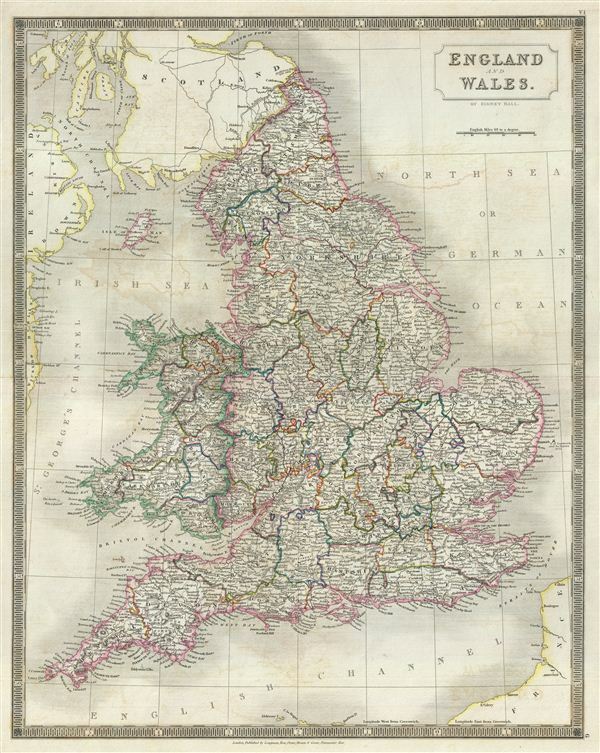 This is a beautiful map of England and Wales from Sidney Hall's extremely scarce 1835 New General Atlas. It covers both England and Wales from Northumberland to Cornwall and includes the Isle of Man. Towns, rivers, mountains, railroads, battle sites, and various other important topographical details are noted. Elevation throughout is rendered by hachure and political and territorial boundaries are outlined in color. Additionally, several battlegrounds are marked, including the sites for the War of the Roses at Northampton in 1460, the First English Civil War in Newbury from 1642-1546 and the Battle of Solebay in 1672, among others. As this map was issued, both England and Wales were in the midst of the Industrial Revolution during which much of the rural agricultural population relocated to urban centers. Rumsey 4224.006 (1830 edition). Philips (Atlases) 758. Ristow, W., American Maps and Mapmakers: Commercial Cartography in the Nineteenth Century, p. 303-09.